I’m a white guy from Kansas who spent the better part of my childhood as what many would qualify as poor. My parents were young when they had my two brothers and me. We lived in a trailer house while my dad and mom were putting my dad through veterinarian school. I have no doubt that people drove by my home and labeled my family as “trash,” of both the trailer and white variety. Fortunately, for me, those labels didn’t follow me out of that trailer park. Once my dad graduated and we were able to live a middle-class lifestyle, nobody looked down on me. Unlike others, I went to high school and never once thought about taking a different route home, whether the hood on my jacket was up, or where my hands were. I spoke with girls and never thought about what an animated conversation might look like to onlookers. I went on to college, then to grad school and to law school, and never worried that someone might think I was there simply because of the color of my skin. My professional life has involved career changes and several moves, but never once have I been reluctant to meet my new neighbors and wonder if my skin color would give someone pause. The truth is, I don’t know what it is like to be black or brown in our culture. I know what it is like to be poor, left out, disrespected and hurt, but I don’t understand what it’s like to be a minority. Yet, I’ve never felt very comfortable being in a crowd of people just like me. I remember researching an assignment when I was a corporate lawyer that required me to research the boards of directors for Fortune 100 companies. What I saw there made me uncomfortable. I was looking in the mirror, albeit 25 years into the future: middle-aged white men with thinning, gray hair, wire-rimmed glasses and a red or blue tie. I’m not suggesting that these men did anything wrong to get to their positions of power, prestige and influence—but the lack of diversity was painfully obvious. Today I’m approaching middle age, although I still have more brown than grey and prefer plastic frames to wire ones. I serve and lead a church in downtown Phoenix, Arizona. Our staff has nine full-time employees, including two Indian-American men, one African-American woman, one African-American man, two white women and three white men. In a word, we are diverse. As great as it looks on the outside, being a diverse staff takes work. We disagree quite often around the conference table because we have such vastly different experiences. But I wouldn’t want it any other way. Because our staff is unique, I often get asked if we hired this way intentionally. The answer: No and yes. We didn’t pass over certain candidates who were more qualified, but we did look out for diversity when hiring. I always want a staff that disagrees and sees things differently. I want to have my presuppositions challenged and my view of reality to be more closely aligned to actual reality. Perhaps most importantly, I want a staff that reflects our surrounding community. 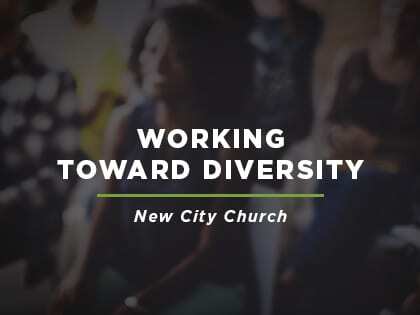 What we’re doing seems to be working, because the volunteer preaching collective that helps shape our weekend sermons is 50 percent nonwhite, and overall, more than one-third of our volunteers at New City are non-white. One caution: Diversity should not become an idol. Diversity doesn’t replace the gospel as the church’s central message. If you live in a predominately white area, it will be more challenging and in many ways less authentic to the community to have a dramatically diverse staff. No one should feel like they are failing as long as their staff and church reflect the demographics of the surrounding community. But if you want to deeply understand ethnicity, privilege and prejudice, you have to surround yourself with people who are different than you. Will we ever get to the point where skin color won’t matter? I’d like to say yes, but my hunch is we won’t—not on this earth and not until the implications of thousands of years of racial divides are behind us once and for all. Still, we are called to work toward that kind of world, especially in the church. As Christians we are called to be restorers and break down the walls that divide us. If each of us is humbly faithful to that goal in each of our contexts, imagine the kind of impact the church can have in society’s journey toward racial reconciliation.